That zucchini just keeps surprising me, so many options! Honestly, I would buy atleast 6 Zucchinis a week and make an array of meals with them. 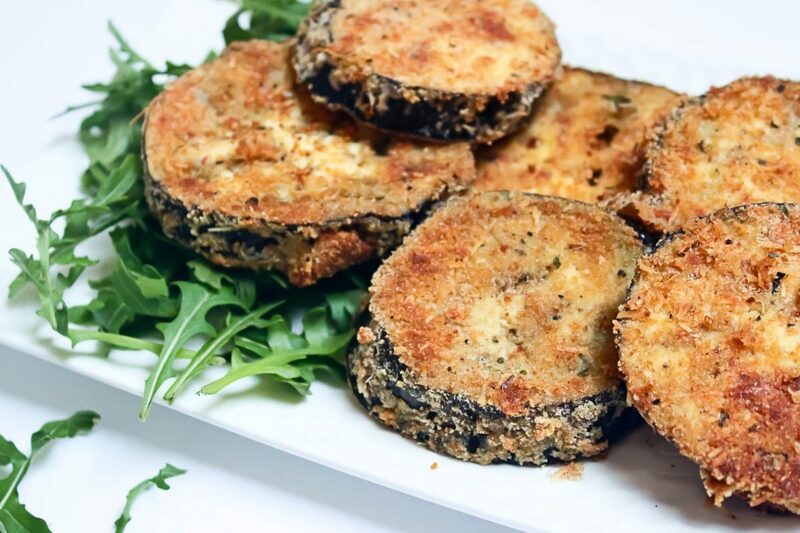 These Gluten Free Italian Crumbed Eggplant Bites are such a great little side, or as a snack on their own, super super tasty mouthfuls. So next time you have a dinner party, whip these little gems up and your guests will think you are the new Masterchef Australia !! Keep up to date with all things Wholesome Living, Wellness tips and incredibly easy, nutritious Recipes!! ¾ cup GF Bread crumbs or Quinoa Flakes – both work amazing! Line your tray with a baking paper. I find this is easier to cook and remove them. In a bowl crack and whisk the eggs. In another bowl combine the quinoa flakes/GF bread crumbs, pecorino, Italian spices, S&P. Cut the eggplants into thick rounds, approx. 2 cm. Dip the eggplant slices in the egg mixture, letting the excess drip off. Coat the eggplants in the crumbing mixture. Place onto tray. Drizzle the Garlic EVOO over the eggplants and place in the oven, for approx.. 18 mins or until golden brow. Flip them over for another 5-8 minutes. Yay! A little piece of Italy awaits you….